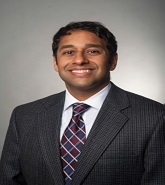 Dr. Shah is an Assistant Professor of Medicine at the Hospital of the University of Pennsylvania and a member of the Renal-Electrolyte & Hypertension Division. He has served in a variety of administrative positions, including Interim Section Chief of Nephrology at the Philadelphia VA Medical Center (2013-2015) and most recently as the Director of Dialysis Programs and Course Director for the Renal Pathophysiology Course at the Perelman School of Medicine at the University of Pennsylvania. He is a graduate of the University of Pennsylvania and Temple University School of Medicine. He maintains an active academic clinical practice with areas of focus in integrated care, resource utilization, dialysis, and nephrolithiasis. He is a Fellow of the American College of Physicians and of the American Society of Nephrology. His research interest is in dialysis and nephrolithiasis.